Check out my new strip at maximumble.com! 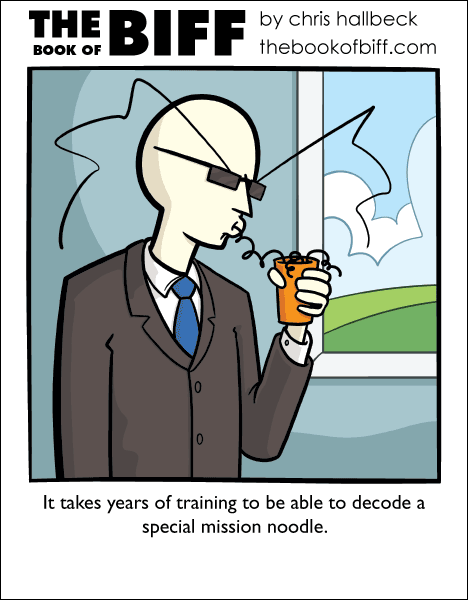 You have to slurp the noodles at just the right speed to make sense of of the bumps and grooves that are used to encode your mission parameters. Preparation of the cup-o-secrets is also very important. If the water is too cold the noodles will break and your instructions will be lost. If the water is too hot you will burn your tongue and that really hurts so pay attention. And afterwards, you must destroy the plate or cup you ate them from so as not to leave evidence. Hopefully the message doesn’t self-destruct after being eaten… ouch! Sonata, that’d be a heavy case of gas. Your attempt at covering it up confirms my suspicions. Time for espionage! whats next water gun lasers? or booger bombs? The real question, is, is it “James Biff” week or “Inspector ‘Biff’ Gadget” week? Given the nature of Biff, I’m guessing the second one. Biff in a “MIB” mode, directives from his alien boss… Keep your eyes open! My favorite flavor is “Sharks-with-frikkin’-lasers-on-their-heads”. Yum!